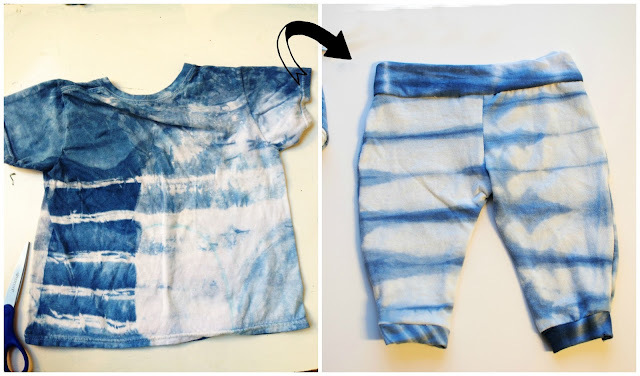 I love the idea of using big brother/sisters tshirts they grew out of to create their baby siblings pants. It's not only recycling but has some sentiment to it. The dyed shirts my boys made so it's all the more fun. I'm planning on doing a couple onesies with this as well. These pants took me 10 minutes each once I got everything down. Fold the tshirt in half and place a pattern on the fold. I just free handed mine initially. Use the bottom hem if you don't want to add a band. This is great for girls pants/leggings. For boys I like to add the band and make them a bit baggier. The should look like this when cut out. Sew inside and outside seams right sides together. 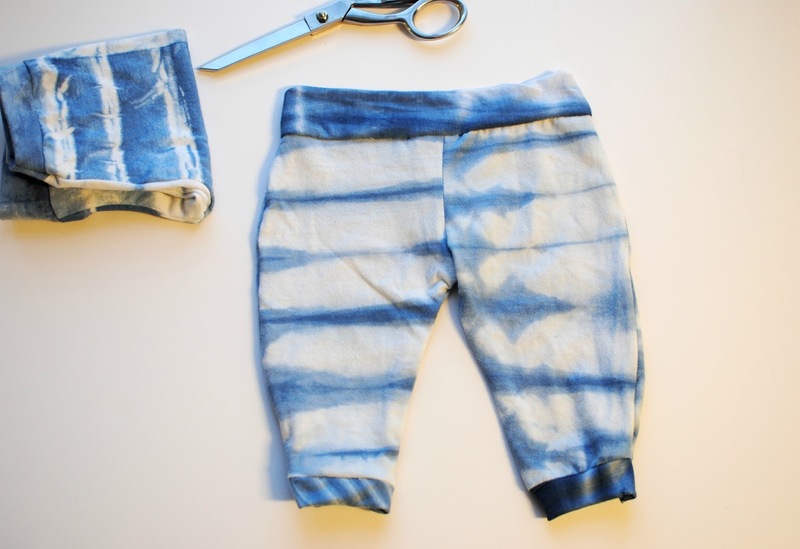 I added a crotch seam on the indigo ones because I cut mine too large initially. You can do this if you want by cutting the middle and sewing it. Using the excess to create the bands for the waist and hems. You should have plenty of options and patterns. Mix and match shirts. Striped bands and prints to make them one-of-a-kind. Cut the bands out evenly. My waistband was wider and my hem bands were thinner. I didn't measure these because you will have to work with what you have. For the hems I had enough to go all the way around, the waistband I had a front and back piece. Mix fabrics or the bands to create fun patterns. Start with the waistband by folding it in half right sides out and placing it along the waist right sides together and sew. Do this to the back as well. While sewing pull the band so it's a bit tighter around the waist. Sew the front and back bands together. on the side seams. If you want the band hem at the bottom, repeat the step from the waist. Again, pull the band so it creates an elastic and is tighter around the bottom. Finish up the sides. It's too simple beyond my imagination! Just beautiful and save money for other things like diapers, baby milk or other toys for your child! Plzzzzz Keep sharing more baby cloth collection.